If you are looking for information on the Fix Rim franchise business opportunity, Fix Rim franchises or Fix Rim franchising, then you have come to the right place. Tap Into This Lucrative Industry! 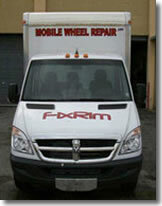 FixRim Mobile Wheel Repair is a leader in the fast growing alloy wheel repair industry. FixRim brings the legendary service of Wheels America, the number one alloy wheel remanufacturer in the U.S. directly to customers. In order to keep up with the demand for our services, we are expanding in major markets throughout the country and are looking for select individuals to join us. 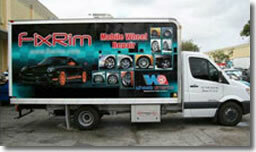 As a FixRim franchisee you will own an in-demand, mobile business in the thriving automotive aftermarket industry. Enjoy the benefits of owning a business that offers the flexibility you desire and the wheel repair services so many consumers need. Potholes, construction zones and curbs can wreak havoc on automobile wheels. Eighty-five percent of all cars and trucks being produced today have alloy wheels which typically cost $400 or more to replace. With FixRim Mobile Wheel Repair, consumers can have their rims repaired, rather than replaced at a fraction of the cost. As a FixRim franchisee you will be poised to capitalize on the unmet demand for wheel repair services with a mobile business that conveniently brings the services directly to the consumer at their location. Your mobile repair shop will be fully-equipped with the appropriate equipment and tools to repair scratched, scraped and damaged wheels quickly and easily. It typically takes an hour or less to repair each wheel, which allows you handle numerous customers each day. Consumers will also value the lifetime warranty and excellent color match capabilities that your business will provide. As a FixRim franchisee you will receive comprehensive training and superior support. Join an industry leader and benefit from our experience, expertise and outstanding reputation.